China's gymnast Deng Linlin performs on the balance beam during the women's gymnastics team finals at the Beijing 2008 Olympics in Beijing, Wednesday. 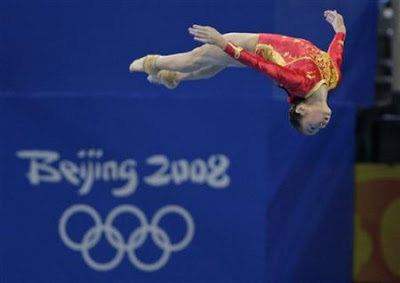 China's gymnast Yang Yilin performs on the uneven bars during the women's team final competition at the Beijing 2008 Olympics in Beijing, Wednesday. 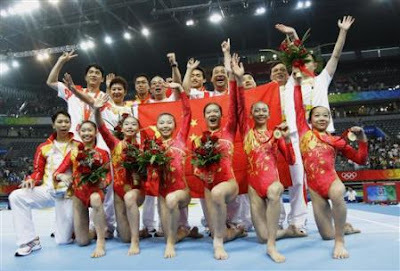 China's gymnastics team poses after winning the gold medal in the women's team final at the Beijing 2008 Olympics in Beijing, Wednesday, Aug 13, 2008. Members of China's women's gymnastics team reacts after winning the gold medal in the women's gymnastics team finals at the Beijing 2008 Olympics in Beijing, Wednesday, Aug. 13, 2008. Her's wasn't the only mistake. Shawn Johnson - the reigning all-around and floor world champion - stepped out of bounds on floor. So did Nastia Liukin. But China wasn't far behind. With the scoring format in finals so unforgiving - three gymnasts up on each event, all three scores count - there was room for one mistake. Maybe two. Certainly not four.